Point Break – the original 1991 Kathryn Bigelow-directed action-thriller, and not whatever the hell this monstrosity is – wasn’t by any means a great movie, but it was and still is a fun and heavily entertaining film that gets by with its simple premise and engaging action sequences, as well as two evenly charismatic turns by Keanu Reeves and the late Patrick Swayze. Absolutely none of those qualities show up anywhere in this remake, which frankly doesn’t even deserve the distinction of sharing the same title as its predecessor. It is, by significant margins, one of the worst remakes in recent memory, one that is so unashamedly bad that it should be best remembered as a bad nightmare, one that you’re thankful is not real upon jolting awake. The basic set-up is the same as the original – FBI agent Johnny Utah (Luke Bracy in Reeves’ original role) goes undercover to infiltrate a group of criminals led by a guy named Bodhi (Édgar Ramírez, in Swayze’s part), only to find himself be torn between his duty and his friend – but that’s as far as it goes in replicating it. To amp up the stakes, or at least according to director Ericson Core (previously known for the cinematography of a far better Point Break remake, The Fast and the Furious), Bodhi and his small group of lawbreakers are not just bank-robbers this time; they’re actually attempting to conquer eight different tasks known as the Osaki 8, which range from skydiving from a plane and parachuting into some caves, to rock-climbing up a large waterfall. Apparently, it’s a means to try and justify their criminal activities, while also showing how gosh-darn spiritual and in tune with nature they are; except that they come off as incredibly pretentious and attention-seeking to a point where it’s almost laughable. In the original, they were just a group of criminals who just happened to enjoy thrill-seeking activities like surfing and sky-diving, which is far more enjoyable and relatable than the annoying douchebags we get here; those guys, as bad as they turned out to be, were at the very least fun to be around, whilst you would try your hardest to avoid people like this in your local Starbucks. The character of Bodhi, in the original, was also a genuinely charismatic guy, and though the part was written fairly well to begin with, so much of that charm came from Swayze’s performance; thanks to him, Bodhi was a guy who was not at all a good human being, but you could totally buy why someone like Reeve’s Utah would fall under his spell, because he’s a real hoot to be around. Ramírez, on the other hand, makes Christian Grey look like Chris Pratt in terms of charisma; his Bodhi is far too brooding, mopey, never seeming to be genuinely happy about anything, and too much of a complete and utter tool thanks to his numerous pseudo-intellectual sayings that he probably read off a fortune cookie and is now trying to pass if off as his own. The actor has done good work in the past, but here he’s absolutely wooden and uninteresting; not once do you buy that Bracey’s Utah (himself a lunk-headed replacement for Keanu Reeves, who could honestly still play Johnny Utah even today) would ever find himself becoming influenced or even entranced by Bodhi’s way of life, because he’s a complete waste of space. It’s times like these when we seriously regret the passing of Swayze back in 2009, especially when a guy like that had genuine charisma as a performer that someone like Ramírez could never re-capture. We feel like we owe Dad’s Army an apology after we declared that film to be a complete bore, when this film is far, far worse; it is so lifeless, so unentertaining and so lacking in anything that made the first film even remotely watchable, that you will honestly start falling asleep about halfway through. There is absolutely no reason to care about anything that happens, or anyone that it’s happening to; they are all stock characters that have had the slightest resemblance to character all but taken away, and the stunts themselves, while impressive if the rumours that the majority of them were done practically are to be believed, are extremely unengaging and joyless, especially when you have zero connection to these character to begin with, something that – once again – both the original and even The Fast and the Furious did so much better. The sheer non-ambition on display here is frankly astonishing, especially when you learn that the budget was just north of $100 million, and that all of that money went into something utterly repugnant and empty like this. 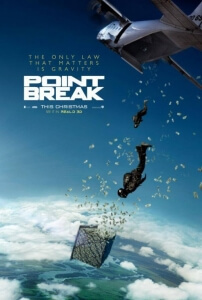 To say that it is even a remake of Point Break is an insult to the original cast and crew that made the original work far more than it had any right to be. They even manage to squeeze in the iconic “firing a gun into the air and going ‘aaah’” bit from the original, but when even a comedy like Hot Fuzz does it far better and ties it in more to the context of its own action, you know you’ve seriously messed up. To say that you should go and check out the original film instead of watching this miserable dreck is an understatement, but you’d be far better off for it. Point Break is an absolutely atrocious remake of the cult 1991 film, one that in every way does things worse than the original whether it’s the charmless leads, the extremely boring pace, or the overly-pretentious nature of what used to be a fun ride. As depressing as it is pointless.